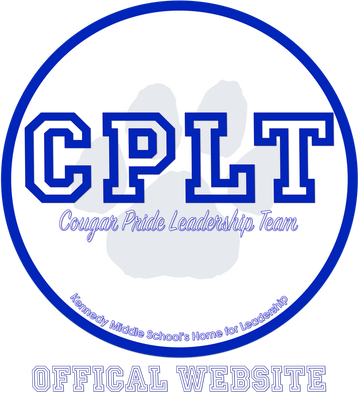 Welcome to the newly designed Cougar Pride Leadership Team website! Learn about CPLT by clicking here. ​Most of the information that you would be looking for can be found on the General page, including, forms, links, important notices, a link to Let's Talk!, Natick Public School's online communication channel, as well as a links to CPLT journal assignments and our Photo Gallery. All information regarding Task Forces can be found on the Task Forces page. We are currently in the process of getting an official CPLT email, but for now you can contact each CPLT adviser individually. Adviser contact information can be found on the Contact page. Click here for the J.F. Kennedy Middle School Mission Statement. Please feel free to browse around our website!